The casual Texas ranch press conference between the US President George W. Bush and Israel's PM Ariel Sharon Monday April 12, 2005 had nothing new to present. The two political pillars expressed their thoughts and vision toward the peace process and the expansion policy of the Israeli settlements existing in the occupied Palestinian territories, particularly around Jerusalem. 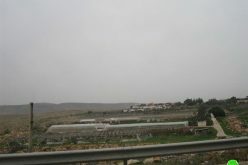 However, each of the two leaders approached the issue in a different manner, while President Bush expressed tepid dissatisfaction with the Israeli incessant policy of settlements expansion, particularly with the 3,500 new housing units set for construction in the most controversial settlement of all; Ma'ale Adumim located east of Jerusalem city, the Israeli PM did not really care. 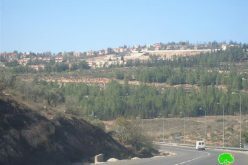 What's more, Sharon laid down Israel's intention of expanding Ma'ale Adumim settlement, which is to create settlements barrier that links Ma'ale Adumim settlement bloc with the heart of Jerusalem. Naturally, Sharon did not come to talk about the devastative impact of such plan on the dominant Palestinian population in the West Bank, which will break into separate entities, or the impact on the Palestinian resident of East Jerusalem who will be cut off from the West Bank or the two parts of it. 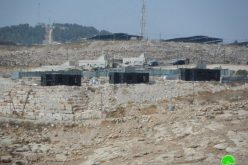 Even more, Sharon went on to reconfirm Israel's and his personal obligation to maintain settlement blocs located in the West Bank under Israeli jurisdiction as Israeli state lands, even thought the Israeli government till this time has not specified what constitutes a bloc and how many are there in the West Bank. Sharon did not even speak of Giva't Ze'ev or Gilo settlements as he considers them integrated neighborhoods within the unrecognized and unilaterally declared illegal boundaries of Jerusalem municipality. Israeli activities and violations starting with the incessant settlement expansion to the Segregation Wall will drive the peace process into the gutter as chances for establishing a viable contiguous Palestinian State are increasingly diminishing. Yes, the US President sounded uncomfortable with Israel's PM condescension to the various and numerous calls to halt all settlements related activities starting from the Oslo peace Accord, Tenet report, Mitchell recommendations to the Quartet and the US road map and finally his own position which articulated 'all means all' referring to freezing all settlements activities without exceptions. Still, President Bush covet to witness the Gaza disengagement go through and ultimately evacuation of random insignificant settlements in the West Bank, which he appears to believe that it would lay the settlements issue to rest, taking on the Palestinians the inevitable new manifested reality of settlements blocs in the West Bank. 'The prime minister and I share a desire to see the disengagement from Gaza and part of the West Bank serve to re-energize progress along the roadmap.' President Bush statement following his meeting with Israel's PM Ariel Sharon, April 11, 2005. Sharon assured President Bush that Israel will comply with the road map obligations regarding the unauthorized outposts and the settlements that he claims are pending upon Palestinian compliance with the road map. As Israel's distorted interpretation of the Road Map is that their part of implementing it will only begin after the Palestinians have completely dismantled their 'terror infrastructure' whose definition and determination is also subject to Israel's perceptions. From the Palestinian experience the Israelis never complied with their part of the agreements but always managed to find an excuse not to fulfill their end of the deal; the excuses varied from not having a partner to meat their demands as the late president Yasser Arafat and now the so called 'terror organizations' and implications that President Mahmoud Abass (Abu Mazen) and prime minister Ahmad Qureia (Abu El Ala') are not working enough towards meeting Israel's demands. Mean while Israel is still fortifying its existence in the occupied West Bank territory and continues to set plans for new settlements and carry out expansion to existing ones. 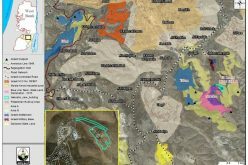 New plans for Israeli settlements include Giva't Ya'el southwest of Jerusalem on confiscated Palestinian lands from Al-Walaja, Beit Jala and Battier towns in Bethlehem district (more than 4000 Dunums will be confiscated) and a new settlement within the Gush Etzion bloc that will confiscate more than 4000 Dunums form the villages of Nahalin and Wad Fukin (between Betar Illit and Giv'ot settlements) which Sharon avowed to settlers that it will remain under Israeli control under any peace agreement. 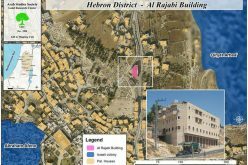 As for the outposts, Sharon said that he will honor his commitment and 'remove unauthorized outposts' referring to Talia Sasson report prepared upon his (Sharon) request and indicated the presence of 125 illegal (unauthorized) outposts. However, the actual number of the outposts exceeds 200 and they are all illegal, which invalidate Sharon's version that attempts to obtain endorsement for 75 illegal outposts and consider them part of the inevitable realities the Palestinians have to deal with. President Bush sent mixed messages when he demanded that Israel freezes all settlement related activities but at the same time admitted the staged reality of existing settlements, as he called the Palestinian to consider them in future negotiations. 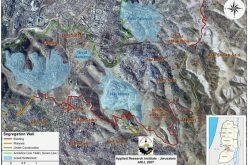 Bush did not talk about the Israeli Segregation Wall (SW) that will come on nearly 38% of the West Bank (western segregation zone 10%, eastern segregation zone 28%) and adversely affecting 270 Palestinian communities with population exceeding 700,000 (29% of the West Bank 2.4 million Palestinian residents). 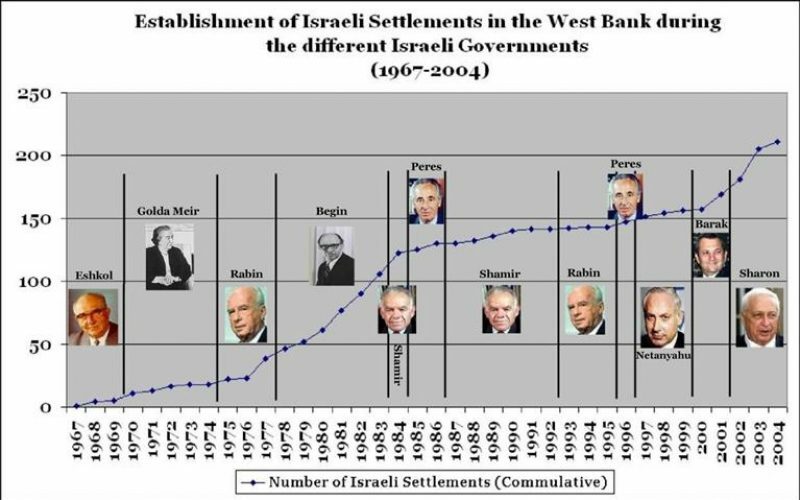 Moreover, Bush ignored the fact that the Segregation Wall will encompass 141 Israeli settlements (67% of total 209 settlements located in the West Bank) accommodating 385,000 Israeli settlers 86% of the 450,000 Israeli settlers living in the West Bank. The US, Quartet, the international law, the UN Security Council seemed to be the last of Ariel Sharon's concerns who defiantly stood their at the conference to confirm that Israel will maintain control of illegal settlements blocs located in the occupied West Bank territory and even went further by upholding the expansion of settlements, particularly in Ma'ale Adumim. 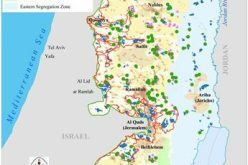 Just like the undefined borders of the State of Israel, the Israeli settlements characterize with fluid boundaries, which seems to be ever increasing by years. Also the number of settlements established and the number of settlers residing there are increasing dramatically. (See Table 1, Figure 1 & Figure 2). & ). Sharon boldly talked of Israeli settlements and outposts using the term 'unauthorized' to describe some outposts he plans to dismantle some time before the end of the year, thus not acknowledging the international community's reference to the settlements and outposts as illegal. Sharon also spoke of fighting what he called 'terror' but chose to ignore the abundant violations (State organized terror) carried out against the Palestinians in the occupied Palestinian territories by the State of Israel. Table 2 shows the various violations committed by Israel since the February 8, 2005 Sharm Al-Shiekh cease fire declaration to the April 11, 2005 Bush – Sharon meeting. The US criticism of the Israeli settlements related activities is much more of an exhibition, since Israel will not cease building or expanding settlements in the occupied West Bank territory as Sharon bluntly stated. Israel has no reason to submit to the international law or to the US well on the settlements issue or any other for that matter, simply because they were criticized and they know that the criticism is the furthest the US or the international law would go.